Two Nerdy History Girls: From the NHG Library: "An Agreeable Tyrant: Fashion After the Revolution"
From the NHG Library: "An Agreeable Tyrant: Fashion After the Revolution"
Loretta and I both have more research books crowding our respective houses than either of us would like to admit. Yet there's always room for one more, especially when that book fills an important gap on the shelf. I'm currently working on a historical novel set in 18thc America during and after the Revolution. (That's all I'm saying for now - everything will be revealed soon enough, with a publication date of September, 2017.) It's a fascinating period in American history, with the dramatic achievements of the war giving way to the difficult process of not only building a new country from the ground up, but also creating a national identity to go with it. Part of that new identity was deciding what Americans should wear. Of course, for many people this meant continuing to wear what they'd worn before the Revolution, but for more fashion-conscious Americans, this was a serious question. They wanted to continue to be as stylish as their counterparts in London and Paris, but they didn't want to follow the fashion dictates of the royal courts. Displaying taste and wealth would also be a challenge in homespun. As the subtitle of this new book asks: "What's a patriotic American to wear?" 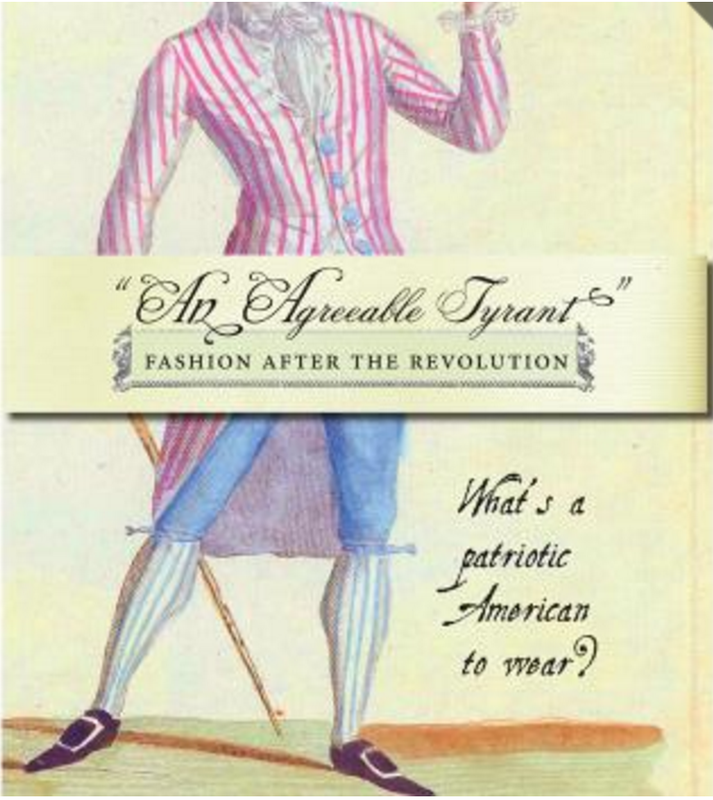 An Agreeable Tyrant: Fashion After the Revolution, above, is a new companion book to an exhibition currently on display at the Daughters of the American Revolution Museum in Washington, D.C., through April 29, 2017. This beautifully written and designed book is much more than a mere exhibition catalogue, however. It contains dozens of full-color photographs of surviving garments - many shown on mannequins, complete with accessories, right - plus fashion plates, portraits, and other images from the era. There are also thoughtful, informative essays written by experts in the field of historic fashion and textile, including lengthy footnotes to primary sources (be still my nerdy history heart!) Clothes for men and women of every class are covered, including enslaved people. And for readers who appreciate the "behind the seams" approach to fashion history, detailed, scaled patterns of garments complete the book. Congratulations to Alden O'Brien, Curator of Costumes & Textiles, DAR Museum, and her staff for creating such a wonderful book. An Agreeable Tyrant deserves a place in every costume-lover's library, and on the shelves of American historians as well. And yes, it's an excellent resource for us fiction-writers. I've already referred to it to "dress" my characters, and I've given it the ultimate endorsement: I didn't receive this for review, but ordered it myself as soon as it was available. If you're interested in purchasing a copy of An Agreeable Tyrant, you can order it directly from the DAR Museum's site here. 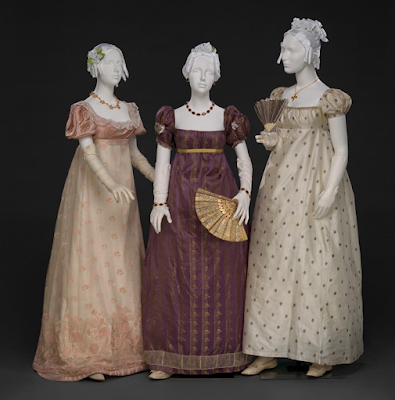 Above (left to right): Silk gauze dress, 1810; Purple silk dress, 1810; Silver brocaded evening dress, 1810s, all from a private collection. Photograph copyright DAR Museum. I actually think more people didn't have the money to purchase goods that made lovely clothes. I think they wore homespun and linen no silk of satin. I know my family was in the united states then fighting for freedom and pretty sure they did not have the money for fine clothes. Thanks so much for this review--Alden O'Brien here with google account nickname posted, sorry! so glad it's been helpful--hope you can come see the exhibit before it closes April 29! And Gail--Actually partly true perhaps your ancestors depended partly on homespun but it's prevalence is greatly overstated by historic mythology (see Laurel T Ulrich's Age of Homespun)...but as I discuss, fabrics at every price point were imported, from earliest colonial era on, -and inventories show not even a majority of households had spinning and weaving equipment--no one could have been entirely dependent on their own production to clothe their families. Gaah stupid autocorrect added apostrophe to ITS before I caught it-- hate that!! The exhibit is lovely and even devoted Regency fans will learn a lot about fashion in Federal era America. I took tons of pictures which will shortly be linked on my blog. This lavishly illustrated catalog has been published in conjunction with the Exhibit of the same name. Superb photography of many of the garments on display along with a large assembly of portraits and fashion plates of the period tell the story of fashion following the Revolutionary War. I can't wait to read this to my 2 year old son. This book is his life 😇 curious, sweet and funny. His mommy has a collection of his photography on her phone. Priceless. When I saw the “An Agreeable Tyrant” exhibit, this vest is what intrigued me the most and I’ve vowed to try to recreate it. I did not purchase the book however, so I don’t have the pattern, but I may be rethinking that decision now. You did a stunning job with it.